Pen and paper and maintenance software faceoff against each other in a duel to see which asset management method works best to control downtime. One of the most deadly phrases in business is, “That’s how we’ve always done it.” Just ask Blockbuster Video. The video-rental company was at its peak in 2004 when Netflix, a relative newcomer to the industry, began shipping DVDs to customers. While Netflix started to boom, Blockbuster continued to operate their stores as normal. The business believed if they stuck with the strategy that had always worked well, it would keep working well. Needless to say, they were wrong. Blockbuster is long gone while Netflix is a cultural phenomenon. This is just one example of a business favouring the status quo over adapting to new realities in their market. And the asset management industry is far from immune from this status quo bias— there are many ways production facilities can fall into the same trap as Blockbuster. Take downtime, for instance. It’s easy to look at the amount of downtime at your facility, both planned and unplanned, and tell yourself that it is under control or that it’s a necessary evil. After all, this is how you’ve always done it, and it’s worked out so far. But what if there was a way to identify unnecessary downtime and cut it out? Less downtime means lower costs, better labour efficiency, reduced backlog and greater asset reliability. Switching from pen-and-paper to maintenance software is one way to achieve these benefits. It may be tempting to continue using the pen-and-paper system that’s worked in the past, however, this business-as-usual approach could hurt you in the long-term. In other words, don’t let your maintenance go the way of Blockbuster. 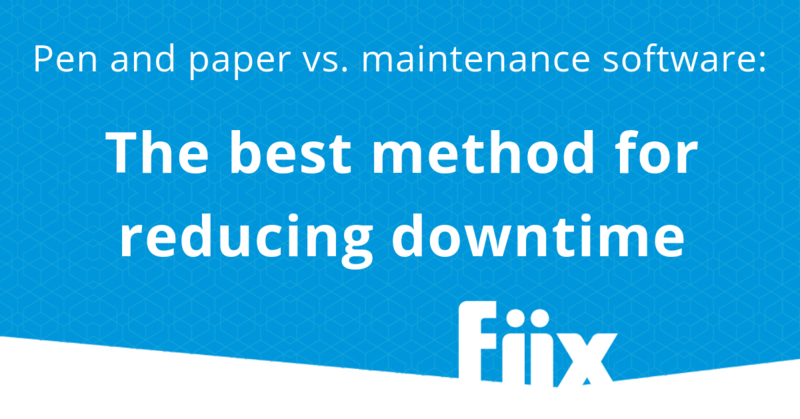 But just saying that maintenance software creates less downtime than pen-and-paper doesn’t make it true. That’s why we pitted the two maintenance planning methods against each other to see which one came out on top. What happens with pen-and-paper: A technician, operator or manager fills out a paper work order form by hand, whether it’s for preventive maintenance or an unplanned breakdown. The work order is then delivered to the office and filed or brought to the technician in an emergency. What happens with maintenance software: Work orders for unplanned repairs are done remotely through mobile CMMS software so there is no need to take time to deliver the request. In cases of preventive maintenance, work orders are triggered automatically through the maintenance software. Time is not spent filling out a new work order for every instance of PM. Winner: Maintenance software. Software, such as a CMMS, can cut down on the time it takes to create and submit work orders with its mobile capabilities. Less time spent filling out and submitting work orders means fewer steps between downtime and getting an asset up and running again. Even by reducing the process by five to 10 minutes for every work order, you can gain hundreds of hours of extra production every year. What happens with pen-and-paper: The technician needs to be found if the work order is an emergency or the technician regularly checks the office, sorts through stacks of work orders and decides which ones to tackle. What happens with maintenance software: Technicians are assigned work orders and alerted of their duties through the mobile maintenance app. Technicians can also see which work orders are outstanding, their priority level, and their status. This eliminates guesswork or shuffling through papers. Winner: Maintenance software. With a digital platform, such as a CMMS, there is less time between work order being submitted and a technician being alerted. The technician can jump on a task quicker, cutting the amount of downtime. Being able to see the status of a work order also allows technicians to check or repair assets that are most important to production. Repairs are done as soon as possible and asset reliability is improved. What happens with pen-and-paper: The technician makes several visits to the asset, stock room, office and colleagues to assess the task, check the availability of parts, access manuals and discuss the asset’s repair history. Only then can the technician lay out a strategy for working on the asset. What happens with maintenance software: The technician reviews the work order, work history, root cause analysis and standard failure codes of the asset through the maintenance software’s mobile platform. They can also access manuals, SOPs, photos and other materials from the app along with inventory levels of any necessary pieces. Then they can create a workable strategy. Winner: Maintenance software. This is the widest margin of victory so far. Multiple trips around the facility, missing parts and lengthy searches for information could add up to hours of extra downtime, if not days. Maintenance software, like a CMMS, groups all asset information in one, remotely accessible place. Software also indicates stock levels and automatically triggers inventory orders when stock is low, so you’re never without an important part again. It may be tempting to continue using the pen-and-paper system that’s worked in the past. However, this business-as-usual approach could hurt you in the long-term. In other words, don’t let your maintenance go the way of Blockbuster. What happens with pen-and-paper: The technician troubleshoots the problem using information from manuals, SOPs, conversations with colleagues and/or memory. The technician can complete PMs from memory or from a written checklist. They then visit the office again to sign off on the work order. What happens with maintenance software: The technician repairs the problem using root cause analysis, standard failure codes and/or corresponding checklists and manuals, all accessible through the digital platform. PMs are completed using predetermined checklists. The work order is signed off on and closed in the software and the appropriate uses are notified. Winner: Maintenance software. The two methods are neck-and-neck when it comes to planned maintenance. However, maintenance software, such as a CMMS, has the clear edge when it comes to addressing unplanned downtime. Software gives the technician a much clearer path to a solution than pen-and-paper troubleshooting. As a bonus, signing off on a work order and getting the asset running as soon as possible is much quicker with software. All this adds up to less downtime. What happens with pen-and-paper: PM tasks are put into a physical calendar based on a review of SOPs, production schedules and combing through past schedules and asset history to determine how often equipment should be maintained. What happens with maintenance software: Reports are created based on asset history and SOPs. This data is then used to determine preventive maintenance triggers, which are then added to the software’s calendar. Production schedules are also added to the calendar and considered when the schedule is created. Winner: Maintenance software (are you seeing a pattern, yet?). Software, like a CMMS, is a clear winner at this stage. It takes considerable time, skill and luck to create the best preventive maintenance schedule based on paper reports, physical manuals and Excel spreadsheets. Maintenance software makes this step faster, easier and more accurate. Downtime is minimized and asset reliability is improved. QR codes give you an easy way to find assets in your CMMS. QR codes are scannable images that are interpreted by a computer and linked to information, such as a website or numbers. Using Fiix’s CMMS, users can automatically generate QR codes for each asset. Once these QR codes are printed and attached to equipment, they can be scanned by a mobile device’s camera and linked directly to the asset’s profile in the CMMS. Having QR codes attached to your facility’s assets can help you eliminate downtime. Think of having all information for a piece of equipment, manuals, work order history, failure codes, etc., in one folder. Now imagine you can access that folder in less than a minute on your mobile device from anywhere instead of traipsing to an office and digging through a file cabinet. You now have reliable information for every asset at your fingertips, helping you check or repair an asset quicker and reducing downtime. Task groups in Fiix’s mobile CMMS act as standardized checklists. They help reduce errors by ensuring consistency and completeness. They also eliminate the need to input the same information multiple times. Task groups can be used for PMs, installations, repairs, upgrades and more. You can attach these task groups to work orders or scheduled maintenance. If additional tasks are added, you won’t need to change each PM individually, you only need to change the task group. Task groups have a two-fold effect on reducing downtime. First, they save technicians time in gathering information from multiple sources in order to construct a process for repairing an asset or conducting a PM. Second, they provide a tried and true guide to completing a task. There is no guesswork involved, which means faster maintenance and increased asset reliability. These benefits add up to less downtime. In the simplest terms, a standard failure code is a very brief description of the reason an asset broke. In the Fiix CMMS, failure codes detail the problem, cause and recommended action for an asset’s most common issues. Technicians can select a pre-set failure code while completing a work order. This will explain what went wrong, the root cause and the best way to fix it. Using failure codes eliminates guesswork in your maintenance. Failure codes provide a consistent solution for tracking failure information. With this tool, reporting problems and determining solutions are much easier. Using failure codes will speed up troubleshooting, eliminate persistent issues, improve preventive maintenance and increase reliability. This is one tool that can have a big impact on the way technicians conduct PMs and repairs, which could lead to drastically reduced downtime. Fiix’s CMMS scheduling feature allows users to schedule regular maintenance reports and have them sent to their inbox. For example, a manager can schedule weekly, monthly or quarterly reports on work orders performed by a certain technician. The reports can be combined into a larger data set to be analyzed and used to spot trends and patterns in a facility’s maintenance program. The ability to quickly create reports means the days of adding up numbers and parsing metrics in spreadsheets are done. Data is calculated by the CMMS, which makes it much more accurate. This information can be used by maintenance managers to make smarter decisions when planning preventive maintenance. A preventive maintenance program grounded in data makes it much easier to improve asset reliability. When assets function efficiently for longer, it means fewer unplanned, time-consuming breakdowns and less downtime. Not all work orders are created equal. One of the most significant differences between work orders is their immediacy. Preventive maintenance on an asset may be long overdue or a piece of equipment that is scheduled for a big production cycle may need repairing. These work orders are a high priority, but may fall through the cracks if a facility relies on communicating important task with pen and paper, whiteboards or Excel spreadsheets. When this happens, downtime follows. Fiix’s CMMS software provides an easy solution to this problem. Work orders created on the platform can be marked with a priority level and sorted based on how time-sensitive they are. Technicians can view the priority level of the work orders that exist or are assigned to them and tackle them by importance. This simple feature allows work to be done when it’s needed most so production is not affected and downtime is minimized.